What the heck is that thing pictured above? If you know, please comment! Personally, I can’t believe I still have this artifact; and that, my friends, lets you in on my pack rat collector tendencies. 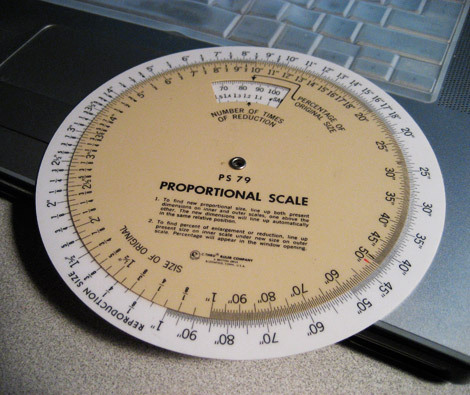 Here is another relic, a life-saving technology for its day, the proportion wheel. Used primarily for “sizing” photos into correct proportion for publication. I used this once recently (although can’t remember why) and was still delighted by its simple effectiveness, not to mention elimination of a need to do math. A little less old-skool, but truly revolutionary in its day–is the Schaedler Precision Rule–which allows for measuring in a variety of systems from picas to points to metric and agate… while LOOKING THROUGH the translucent plastic. Also, these are flexible enough wrap around a curved object (cool!). 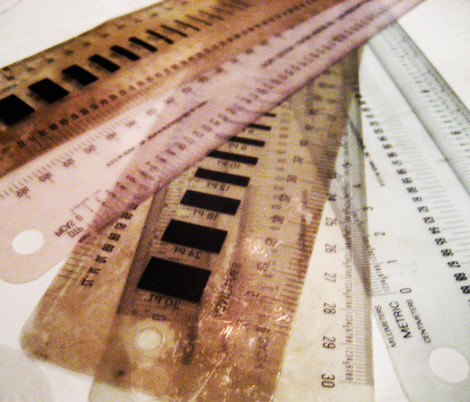 Back in the 80’s when these came out ANY professional worth their salt had a set of these super-expensive tools (each ruler now retails for $20+). They sort of separated the pros from the hacks, if you will. I still love and use mine, although some of them are older than… well, dirt. Ok, this is a little off topic, but I had to include it. 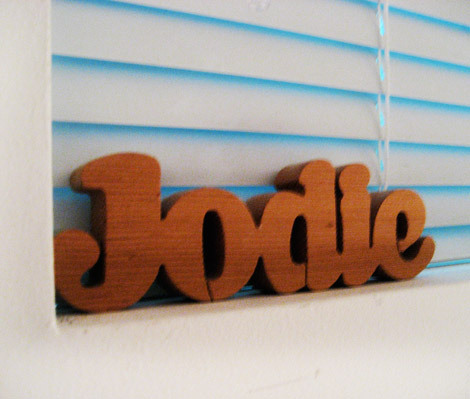 This 70’s wooden name thingee has been on my desk since I scored it at Value Village Thriftstore many years ago. I love it because it’s so hilariously UNcorporate. And, it’s not even the right spelling of my name, which makes me laugh every time I see it. Anyone want to name that font? But back to those comprehensives. Before Apple, we made these all the time! There were no files or pdfs, and in order to show clients design solutions, we purchased lots of colored papers… hand-cutting, taping and folding, to produce a tactile/visual experience of the final printed piece. Rather than just… (wait for it)… a MAGIC MARKER sketch! Yes, young people. Magic freaking Markers, which were not so magic after all. The day I was making comps, 13 yr old daughter Molly was home and she too joined the fun. 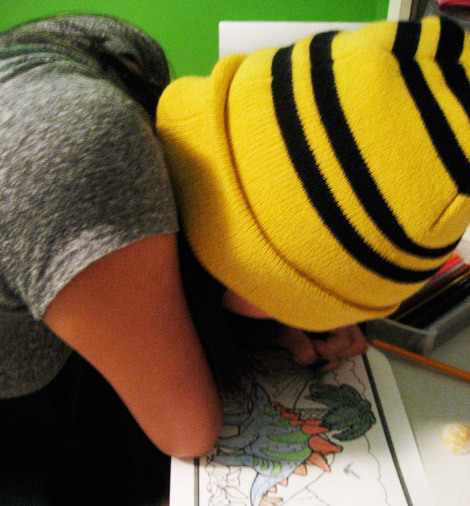 Crayons? DEFINITELY old skool. So, why WAS I making comps again? Well, in the case of this project, I wanted to explore aspects of design and manufacturing that just aren’t visible on-screen. I know, can you believe that?? But the fact is, if aspects of your communication problem-solving rely on the pacing (literally and figuratively) or unfolding of information, or on special techniques such as die-cuts, it’s important to share these ideas with my client fairly early on in the process. 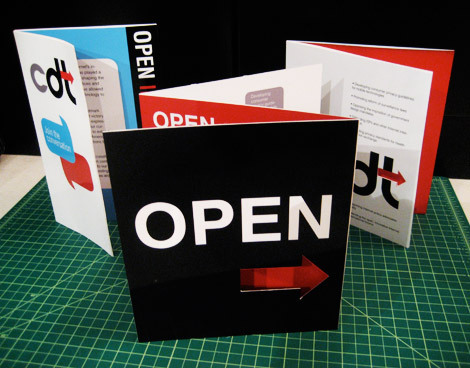 Pictured above are 3 of 4 comps produced to show various brochure sizes, folds, and proposed die-cuts. Once we narrow this down, I’ll be able to focus on all of the refinements to typographical, color, and image details. There are times I do miss those days of handcrafty goodness in graphic design. And I think this at least partially explains the proliferation of designers-turned-knitters/potters/jewelers… insert-craft-of-choice here. Ultimately though, I love designing on the computer and wouldn’t trade it for the old days of messy wax and tracing out fonts by hand. 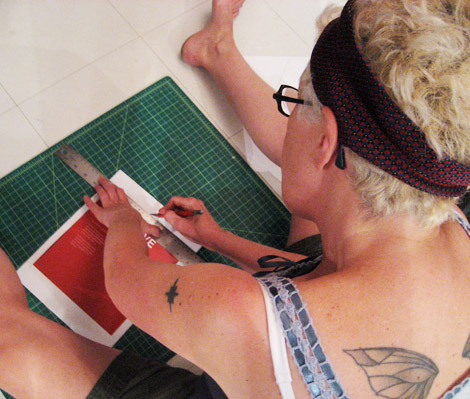 Still, I welcome the opportunity to sit on the floor and hold an xacto knife… it really is fun. 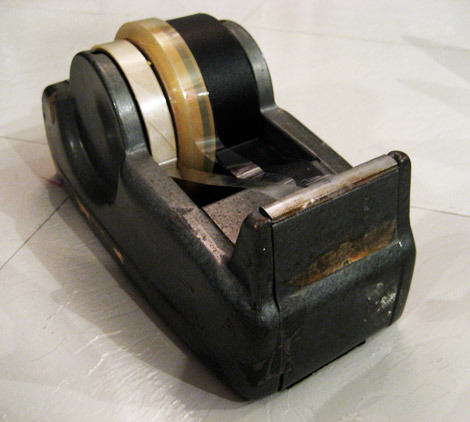 Well my phone selected this web page f or me but I’m def up to the challenge: it’s a roll of aging clear tape with registration markers for printmaking or publishing, ain’t it? Would make a lovely cuff as well. 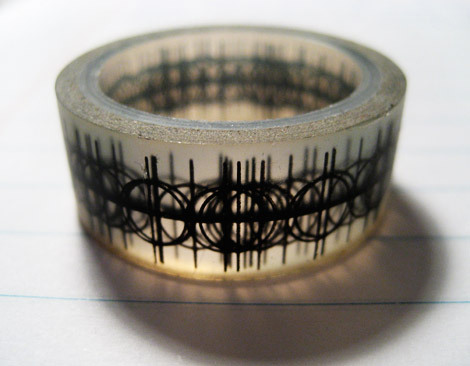 Yeah buddy, those are registration marks on clear tape… yep! Are you a former paste-up queen too?? As for a cuff… too small, unfortunately. Love the idea tho!